Onkyo CR-L5 - "rare hi-fi product"
Bang & Olufsen BEOMASTER 1900 - " excellent for a grandpa who send"
Yamaha MCR-332 - " One of the best compact systems on the market!" Denon DM-39 - " What a pleasure to listen!" 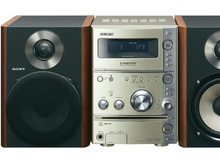 Bang & Olufsen BEOMASTER 1900 - " hi fi vintage"
Sony FST-SH2000 - " Is the stereo, that excrement is the fine chocolate!" Yamaha Pianocraft e320 - " the small chain that goes up ..."
Sony MHC-RG333 - " excelente hi-fi"